If at all possible I try to see the film before I review the soundtrack. As a reviewer this definitely helps me to better understand the material that I’m talking about. 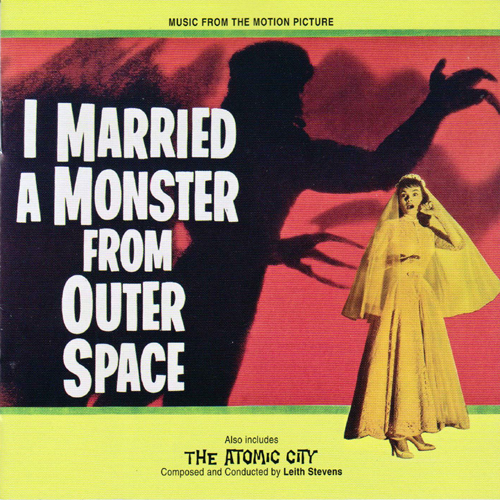 Such was the case with the current Kritzerland offering “I Married A Monster From Outer Space” starring Gloria Talbott, Tom Tryon, and Ken Lynch. The low budget sci-fi thriller from Paramount ($175,000) was really an ‘A’ budget compared to Monogram and PRC and this reviewer had no problem at all with most of the special effects. The story line has some similar ideas to “Invasion of the Body Snatcher” with aliens taking over humans bodies. If Paramount had chosen a less lurid title, as it seemed to be marketed at the drive-in market, it might have gotten a little more serious attention. The soundtrack to which no credit is given because of the strike is really unique as it brings together cues from many composers. I’ll guarantee you’ll never find Victor Young’s “Shane” and Aaron Copland’s “The Heiress” material in the same film again! Bruce Kimmel took the time and effort to list all of the re-recorded material and the film where it originally came from. Composers include Van Cleave, Young, Webb, Livingston and David, Friedhofer, Scharf, Salter, Waxman, Weston, Copland, Shuken and Cutner, Stevens, Amfitheatrof, and Murray. Whoever put this together should have been given an Oscar for a job well done on a patchwork quilt of themes that certainly work well in the film. There are 24 films representing quite a compilation. The opening theme plays against the universe as a planet moves closer and closer. The brass is the dominate sound as they play an extended fanfare also providing their own harmony and setting the stage for what you’re about to see. Red Cross Juke Box #3, Never Before, and Honeymoon Eve are all tracks that can be classified as danceable sweet band tracks that are source music for the film. Transformation of Schulz is classic sounding Salter that could have come from one of his monster movies. Juke Box from Paul Weston is a big band arrangement that features a nice trumpet solo backed by a very active trombone section. This is a nice track of swinging jive! Fight With Monsters will remind you of the typical sci-fi sound of the 50’s with swirling strings and urgent dissonant brass dominating the track. To Know Love/Finale offers a combination of soft romance, urgency, dissonant brass statements, and a concluding coda to end the soundtrack. This is a mono 50’s sounding recording which is limited to 1000 copies and overall it is clean and listenable with only a couple of spots where there is wow and flutter. It is certainly nothing to discourage anyone from buying it. The other half of the release “Atomic City,” composed by Leith Stevens will be discussed in its own review. When I received my review copy of Music from the Edge I was totally confused as to where this material came from. There was no mention in the liner notes and there was a film made in 1997 called”The Edge” starring Anthony Hopkins and Alec Baldwin. There was also a Russian made film called “The Edge” made in 2010. A Google search results in pages of different scenarios! For all I knew this was commercial music for the shaving gel! The music was written for the 2009 film “The Edge of Darkness” that starred Mel Gibson and dealt violently with a father’s loss of a daughter from the mob, a hit. This score was rejected and replaced with one written by Howard Shore. Like Aaron Copland, another outstanding American composer, John Corigliano has only dabbled in film, having composed four soundtracks since 1981. Copland for your information did six. While both composers were sparse in their output two Oscars were given out, one to each composer giving you a small idea of the vast talent of each composer. In fact between the 10 feature films there have been 8 nominations, something which says it all. 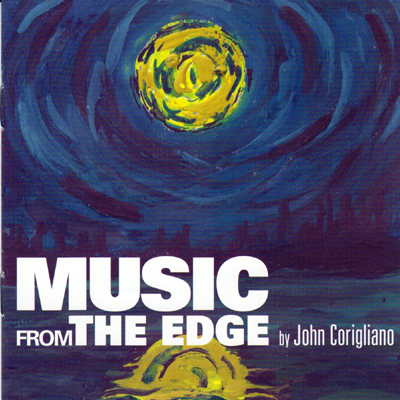 Corigliano approached this recording as a tone poem/suite of eleven movements totaling 38 minutes. This is truly a classical approach as it is performed by The London Metropolitan Orchestra conducted by Leonard Slatkin. His Daughter’s Death, the opening track begins in an innocent fashion with a solo clarinet providing the sad opening melody. A flute continues the melody with help from the strings. Wind chimes are the signal to something far more ominous as low disturbing strings are followed by a couple of dissonant brass motifs before the solitude of the opening of the track returns. There is an interesting foghorn type sound from the flutes which required practice on the part of the flute section. Reflections opens quietly enough with an oboe and then a return to the “daughter” theme, twice a hint of a carousel before there is a return to the main theme again. The track ends with a disturbing sequence of low growling brass and dissonant strings complemented by percussion. Her Home quietly returns to the “daughter” theme once again before it leads the ears to sentimental quiet times with a minimum of orchestral members. Pursuit is a strong example of well written underscore. The brass got no vacation on this track as they’re asked to perform difficult double tonguing techniques complemented by timpani. The strings offer a Herrmann type sound in the background. Her Friend’s Death is another exercise with dissonant brass, swirling strings and percussion. Hideout, the shortest of the tracks at two minutes, offers a flute without a melody. A reference again to the carousel melody which is continued by the strings highlights Family Shave which ends on a disturbing note. A Sober Story is certainly a quiet moment of sadness with strings being given the job of providing the mood and atmosphere. It ends with a reference to the “daughter” theme slowly building to a crescendo with a snare drum guiding the listener. The Escape begins with low disturbing strings which build to a loud dissonant passage from the horns which quickly disappear. The title Revenge again features the carousel theme with plenty of depressing underscore. This track made its point without having to go over the top with sound. Reunification, the longest of the tracks at six plus minutes hints at the “daughter” theme with the flutes before the ice is broken with the oboe, clarinet, and strings offering a romantic version of the theme. Brass and lush strings also play a strong part before Hila Plittman appropriately ends the track with touching words. This is nicely recorded and one could make a strong case that this is a symphonic piece that stands on its own without the film. An excellent fourth addition to your Corigliano collection. Highly recommended. No limited edition sales apply on this recording. Don’t let the new artwork fool you! This Intrada release, an unlimited pressing, is the complete original motion picture soundtrack from the film starring Cary Grant, Audrey Hepburn, James Coburn, and Walter Matthau in celebration of the 100th anniversary of Universal Pictures. It is nearly 78 minutes in length compared to the re-recording of the material which logged in at 29 minutes. The re-recording was a policy that Mancini did to enhance the popularity of his recordings, making them very easy on the ears as well as danceable. They were easy listening/big band style that introduced this reviewer to the soundtrack world. As some of you know “Peter Gunn” was my very first vinyl purchase in 1959. The recording techniques used in his vinyl LP’s were far superior to the methods used by Hollywood as one can hear if you compare. This is a clean and faithful re-mastering but it is in mono and lacks that “living stereo” feeling. 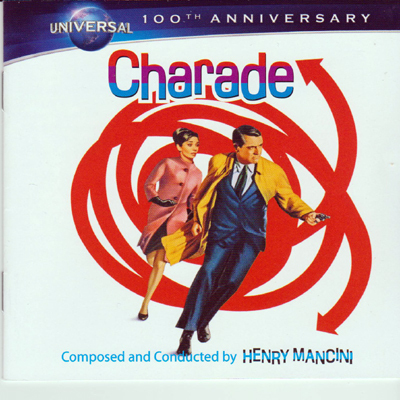 The Charade Logo, a tense opening bit of underscore lets it be known that this is a thriller and puts you on the edge of your seat right away. The Main Title which you’ll hear often and in numerous orchestrations begins with pulsating Latin rhythm which is a prelude to the haunting theme played on a cimbalom which is a large dulcimer that uses mallets. This is a prelude to a snare drum, brass, and a big band riff before it changes to romantic strings which offer a love version of the theme. Megeve offers a very danceable Latin big band number which features the brass offering the melody followed by a piano solo, tenor sax, muted trumpet, and trombone all with the steady Latin beat. This track appears on the album but is extended on this release. Latin Snowfall offers some nice trombone work in an arrangement that Mancini lovers are accustomed to. Positive Identification is a first offering underscores tension type material with lower strings and a creepy harpsichord. This is a similar sound to one found on “Experiment in Terror” Somewhat different on the Intrada release is the vocal rendition of Charade which uses different words and a male chorus as opposed to the typical chorus of Mancini which was a mixture of female and male. I prefer the album version but the reason could be that I’m so use to it that anything different is not comfortable to me. Empty Room is another new track and offers a heartfelt solo piano of the Charade theme. This is a favorite new track on this Intrada release. Bye Bye Charlie is a short classical sounding chamber piece with violin and cello offering the melody with nice harmony/counterpoint. Punch and Judy comes off sounding much better on the stereo album version. It is a fun carnival/circus track that would fit a cartoon, silent film, and others. The Intrada version has a bit of a shrill to the upper end. Notre Dame/Drip-Dry Waltz begins with another romantic version of Charade (not included on album) and transitions very nicely to the Drip-Dry Waltz which is quite humorous. This is another favorite track on the new Intrada release. Bateau Mouche is a classic French sounding piece complete with violin, accordion, and wordless chorus. Hook Fight, not included on the LP is fine underscore material that is a welcome listen. Mean Cat repeats the Charade theme but adds a nice little bit of underscore at the end of the track. This is a welcome release and well worth having whether or not you have the album version or not. I now have both so the decision was easy for me. But if you have nothing and have to choose go for this release. You won’t be disappointed. For your information I’ve included the track listing of the album with matching track numbers from the Intrada release. This reviewer is also a collector of compilation collections and I prefer to have companies like BSX make the decision for me. Lately the company has definitely gotten outside the box and offered material arranged in a unique fashion such as classical guitar material from Gregg Nestor. Classical guitar and Rozsa do blend quite nicely together! 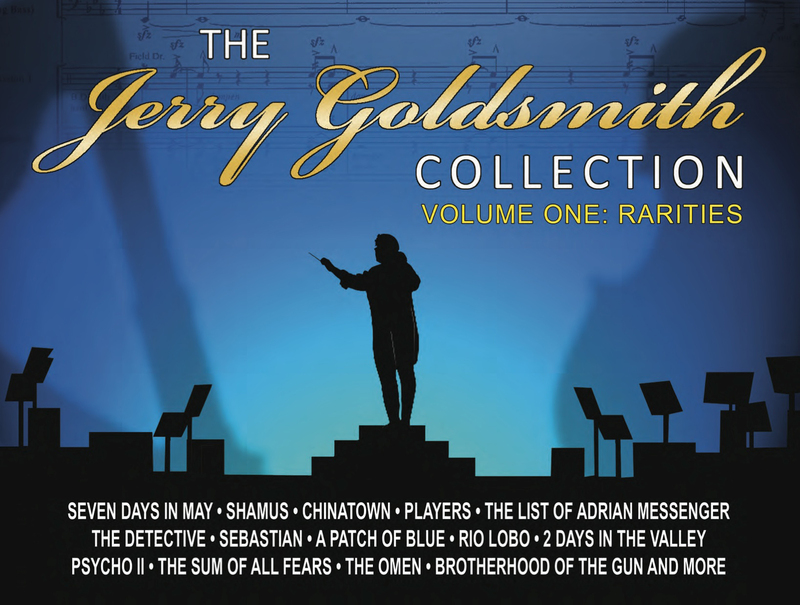 This latest compilation offers as the title says some rarity material from Jerry Goldsmith. Dominik Hauser, who recently had his newly created score for “Wings” released by La-La Land, is the chief arranger for most of the tracks and offers piano, synthesizer, and trumpet as arranging/orchestrating of material. Also contributing to the effort are Beal, Park, Northam, Cirino, Grossman, and Wiegand. Judge Dredd starts the CD with an eye opening synthesized rendition with pounding percussion in a trailer arrangement. Seven Days in May, the longest track is an arrangement by Hauser of the complete score featuring the drums of Kurt Walther. This arrangement offers percussion (tuned sometimes), with a piano providing a jagged dissonant harmony. Truly a unique track and arrangement of seldom heard material. Chinatown offers the familiar trumpet solo against a layer of harp and strings with piano harmony. Trumpet player Roy Wiegand also offers solos on A Patch of Blue and Hollister: Brotherhood of the Gun. The Detective seems to have a Bill Evans style arrangement in mind for the sad and haunting theme (Dark Song) for the solo piano played nicely by Mark Northam, who also contributes another solo on the seldom played theme from The Players. Gregg Nestor contributes two fine classical guitar tracks. Toccata For Solo Guitar a seldom if ever played classical piece offers a melody which begins and ends the work in between some improvisational material typical of a toccata without any fugue material. Rio Lobo, another seldom played Goldsmith, is the classic yearning theme that many westerns over the year have offered. Gregg offers the theme along with fine harmony making this a pleasant listen. Psycho 2, a nice piano solo by Park with layers of synthesizer material and a cello offering makes for a nice listen. Katie Campbell gives wordless support to the often played Poltergeist arranged elevator music style by Dominik Hauser. She also contributes her voice to The Illustrated Man. Sum Of All Fears is also given the elevator music arrangement with guitar and piano complementing one another. I would amiss if I didn’t comment on the digital vs CD sound quality difference on this recording. I was given initially the digital file in which to evaluate the recording for review. Recently Mark Banning of BSX Records was kind enough to send me the CD and this allowed me the opportunity to do and AB comparison of the two recordings. The difference was as evident as listening to your favorite song on the radio and then playing the CD of the same recording through your stereo system. In other words there is no doubt as to which recording came from what source. While I certainly realize the huge advantage to being able to send the material in a digital format I also feel that a recording such as this one is not able to showcase the quality it has to offer. An excellent example of this is the cello solo from Peggy Baldwin where she plays the love theme from the Sand Pebbles. Her solo has a richness to it that isn’t evident on the digital offering. The harmony on the track offers a greater distinct separation between the instruments. I fully realize that the digital files are going to be what is available but I for one still enjoy listening to the fullness of a lossless wave file. “The title To The Fore comes from Grainger’s colorful ‘Blue-Eyed English’ directions which replace their Italian counterparts in his scores,” writes Dana Perna of the International Percy Grainger Society. His directions such as louden lots, lingeringly, slow down lots, as well as dished up, blend band, and tone wrought certainly gets your attention. He would also on occasion make grand entrances by leaping over his piano when he came on stage. Through his concerts he financed a Grainger house in Melbourne where he offered some of his very personal items, a topic not appropriate for this review. As a reviewer I’m forever searching for new sounds and Delos has been most gracious to open up their catalog allowing me to explore new material. As I investigate new areas of music I can pass this on to you perhaps opening new doors for you also. Percy Grainger, composer, pianist, folk song collector, and musical inventor certainly qualifies. Born in Australia Percy found his way to America in the early part of the 20th Century; toured as a pianist, taught at New York University and Chicago Musical College, participated in the war effort (pictured on CD booklet with one his favorite instruments a soprano saxophone), invented electronic composition machines in order to produce “free music” characterized by small intervals, “gliding tones” and irregular rhythms. He was one of the first to make use of tuned percussion. He arranged hundreds of folk songs and made use of the masters Faure, Grieg, Bach, and others in his arrangements. Quite a talent! Country Gardens, his most popular piece is offered as a Grainger arrangement and arranged by Sousa for his marching band. The creative talent of Percy is never more evident than his style filled with whimsical reeds, soulful sax, and harmonious brass which can also be dissonant. The Sousa arrangement is a straight marching band rendition that is pleasant but not creative at all. “The Gum-Suckers March” (colonials sucked the eucalyptus leaves). Not the typical march you’re use to listening to Percy incorporates a busy brass section along with piano in this rather catchy melody. Percy was always looking for unusual combinations and found use for a heckelphone and piano strings struck with a percussion mallet as well as low brass for this clever arrangement of “Children’s March: Over the hills and far away.” “March” and O Mensch, Bewein’ Dein’ Sunde Gross,” compositions of Bach are given the Percy band treatment. It is fun to hear a fugue performed by wind band. “Ye Banks and Braes o’Bonnie Doon” is a Scottish melody and there will be a tear in your eye is you’re from that part of the world. A wonderful euphonium is to be found in a Faure tune “Tuscan Serenade.” “Chorale No. 2” melody comes from the Franck Symphony in D minor and is a fascinating way to hear this music especially if you enjoy the symphony version. 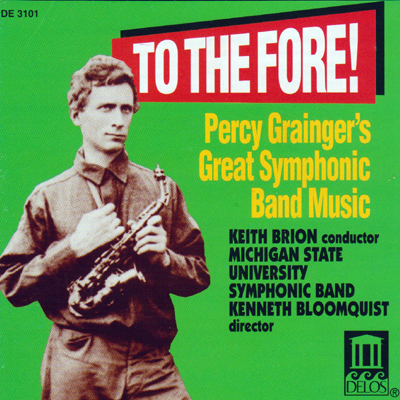 The CD is nicely performed by the Michigan State University Symphonic Band conducted by Keith Brion, who was also involved as a curator and a one person crusade to get some of Grainger’s material published. If you’re looking for something new to explore this recording will fit the bill and also introduce you to Grainger. “I have great affection for this symphony and deeply regret it has lead such a tragic life,” wrote Tchaikovsky in 1883 about his First Symphony. Upon graduation from the Conservatory of Music St. Petersburg, Tchaikovsky became a staff member moving to Moscow and it was here under the guidance of Nikolay Rubenstein that he began to work on his first symphony in 1865. His first and second attempt both were met with disapproval of his teachers Anton Rubenstein and Nikolay Zaremba. One of the reasons that made this a difficult task was it was done on a part time basis after working all day as a teacher. Being possessed caused sleepless nights, which further added to the aggravation. Also keep in mind that during this time Tchaikovsky was dealing with personal demons of a failed marriage, his homosexuality and hallucinations/insomnia resulting in a nervous breakdown. The second and third movements (adagio and scherzo) were performed in 1867 and were met with mild support. However, the work was subjected to another revision before it was finally performed as a complete work in 1868. This performance received an enthusiastic approval from the audience. Still not wholly satisfied with it Tchaikovsky offered another revision in 1874 and again in 1888. As far as I know it is the 1874 revision that is performed by the Russian National Orchestra conducted by Mikhail Pletnev on this SACD CD from Pentatone Classics (PTC5186381). This is not one of his well-performed works but having said that it certainly displays all of the characteristics we’ve grown to love and admire in his work. Tchaikovsky considered the symphonic form a way for him to express his feelings and express them he did. This is a work that is filled with sentiment and emotion! “Reveries On A Winter Journey” is the title given to the first movement an allegro tranquillo. This winter journey begins slowly with shimmering strings the flutes offering the happy melody until the string section takes over with harmony and counterpoint from the other parts of the orchestra. It slowly builds to a rousing crescendo filled with tension and intrigue and returns to the slow tranquillo pace offer a second theme before it returns to the main theme once again. The pace from Pletnev is a slower one in parts from other recordings I’ve heard and I like it. “Land of Desolation, Land of Mists” is an adagio in the fine tradition of Tchaikovsky. Quiet and delicate it opens with yearning strings, which give way to an oboe driven melody, bassoon lurking in the background with fluttering flutes to complement the lush theme. The “Scherzo” is bubbling with enthusiasm as the strings carry the melody but the woodwinds are quite an active part of the movement. Midway through the theme changes to a slower sentimental one. The theme came from his earlier written Piano Sonata and like the rest of the work. The “Finale,” begins with atypical Russian Folk Song very steeped in tradition. The ominous timpani are a signal and the folk song gives way to a second theme, which cleverly becomes a fugue. The ending is a rousing one as Tchaikovsky often wrote. In this section one can hear the superior playing of the Russian National Orchestra and the clarity of the SACD recording although this reviewer felt the tempo lagged a bit. Perhaps the tempo is more what Tchaikovsky had in mind? The often-recorded Slavonic March (Marche Slave or Serbo-Russian March) is a patriotic work that combines two different Serbian themes with “God Save The Tsar.” It was written about the Serbian-Ottoman war. If you’re looking for something highly Russian to listen to this is definitely for you. It is recorded in such a way that it is very easy to hear the different sections of the orchestra. I have recordings of this work where it becomes quite muddy and one can only hear the main melody.